I had eggs, sausage and rye toast (I love my rye toast). My wife had a large stack of pancakes. The waitress said that they are large pancakes, you might want to try the shorts stack. 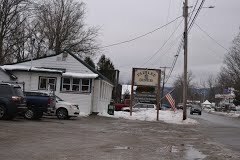 They were large pancakes with real VT maple syrup.